july 31, 2000. The recent acceleration in the demise of single-screen movie houses has me doing an unusual thing: writing a eulogy for a movie theater that closed eleven years ago. The Coliseum on Clement Street closed in 1989, knocked out by the Loma Prieta earthquake before inevitable economics could do it in. If you grew up in San Francisco twenty years or more ago, then you probably had your movie theater: the neighborhood palace in walking distance whose swirled carpet patterns and chipped gilded accents you knew intimately. The big green Coliseum acted as the centerpiece for many of my childhood adventures. I passed it on my way to school every morning and short-cutted through the alleys around it to get to Woolworth's. In the summer the Coliseum hosted a children's film festival of sorts: a different movie shown every day, usually two or three decades old. I can still remember the sculptured relief of a woman with flowing hair on the ceiling, riding what looked to me like a surfboard, high above the always-closed balcony (sneaking up there one day with my friend ranks high in childhood triumphs). The Coliseum wasn't the Richmond District's first theater. Fishers’ Theater opened on Sixth Avenue and Clement in 1907. Anita Day Hubbard reminisced about Fishers’ in the San Francisco Bulletin back in 1924: "The admission was five cents. The place was very small and dark, and the screen waved in the draughts, and the pictures were pretty bad." Fishers’ moved up the street to a better building on Seventh Avenue and the old venue switched hands to become the Palm Theater. The district and the movie industry both grew, and by 1913 the Clement had risen for a short existence on the corner of Nineteenth Avenue. Farther out, on Twenty-third Avenue, La Bonita opened. Current residents know La Bonita now as the 4-Star, still holding on despite a few threatened closures. The Lincoln Theater, on Sixth Avenue between Clement and Geary, was in Anita Day Hubbard’s words "the first pretentious house to be built" in the area. One longtime Richmond District resident remembers weekends at the Lincoln: "Adults couldn’t go to the matinees because of the number of screaming excited kids. It was just a madhouse." The Coliseum opened in November 1918 with a Mary Pickford film ("Johanna Enlists"), a Mack Sennett comedy, and a newsreel on the bill. The dedication drew Mayor "Sunny Jim" Rolph and all the dignitaries the neighborhood could muster. A little over a year later the house was expanded to handle the "theatrical demands" of the district. A thousand seats were added to bring the capacity to close to 3,000. 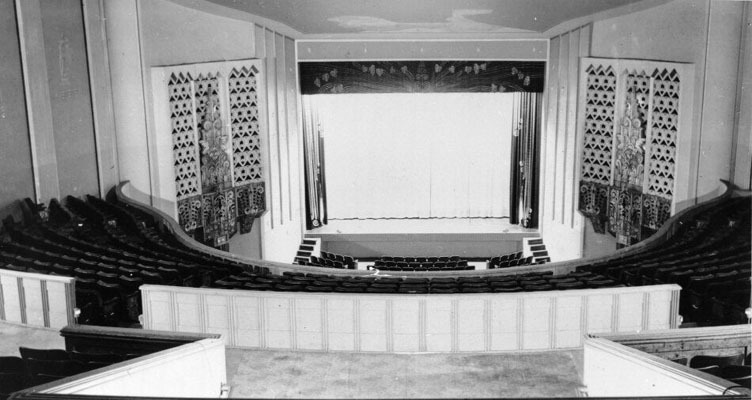 The owner, Samuel H. Levin, assured the public, "I shall endeavor to maintain in the redecoration the same homelike atmosphere that has made the Coliseum unique among picture theaters, by using only soft neutral shades, luxurious carpets, and an indirect lighting system, eliminating all startling colors and over-ornate decorations, so often found in the theaters." In 1929, the Coliseum welcomed sound to the movies. Vitaphone and Movietone equipment were installed, making it a "talkie" house. Al Jolson’s "The Jazz Singer" inaugurated the new technology at the Coliseum in February of that year. To get an idea of how a movie theater could define a neighborhood, one need only look at the names of some local businesses in 1937 — Coliseum Bakery, Coliseum Beauty Shop, Coliseum Furrier. And on and on: a haberdashery, a market, a pharmacy and a shoe store. You won't see an AMC Dry Cleaners these days. Most of the Richmond’s theaters found a way to hang on. The 4-Star and the Bridge became art houses, offering independent and foreign films to attract audiences from the whole city. The Balboa hit on a good formula, showing second-run films as double features for a reasonable admission price. The Alexandria, whose Egyptian motif was highly acclaimed in the 1920s, had to tear its magnificent screen into bits and become a mini-multiplex. Now the mighty Coronet, renovated just a few years ago, is on shaky ground. If a blockbuster showplace like the Coronet is in trouble, the end of all these palaces seems grimly inevitable. On October 17, 1989, there was a 5:45 show scheduled at the Coliseum. The Giants and A’s were about to start Game 3 of the World Series, so there may only have been a handful of folks preparing to see the film when the earthquake hit. Soon after the upheaval, United Artists talked of repairing the Coliseum quickly. But it never happened. The last movie to play in the great green house was "Field of Dreams." You may remember the film featured a disembodied voice that promised Kevin Costner, "If you build it, they will come." Steve LaBounty. An earlier version of this article appeared as part of the Western Neighborhoods Project.